In my last Writing My Novel post (which went up almost five months ago. What the hell???) 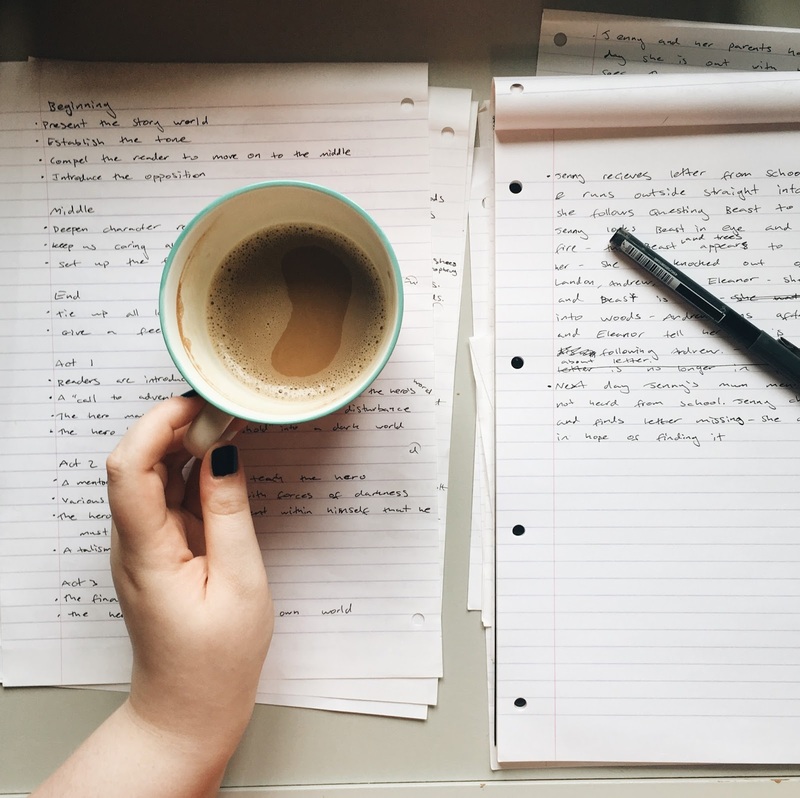 I talked about writing my first draft during NaNoWriMo in 2015. Today we're moving onto my second draft. Or, what was supposed to be my second draft anyway. Let me explain. I somehow managed to let a whole year slip past after the first draft (I'm very good at this. Hence it being five freaking months since my last Writing post!) before finally tackling a second draft during NaNoWriMo 2016. It would be fine, I thought. I already had my, admittedly lack-luster, first draft and I just needed to add things in, tighten things up, tie everything together. Make it better. If I could win NaNoWriMo with the same story a year before with nothing to start from, I could win it again with that first draft behind me. And I did! Just. I mean, I hit 50,000 words. Just. Remember my graph from last time? How I was often a little bit behind the daily word target but still managed to write at least a little bit every day? Not quite so this time round. I turned 25 on the 4th November and spent a few days celebrating so that's why that first week was such a disaster but after that? I have no excuses. 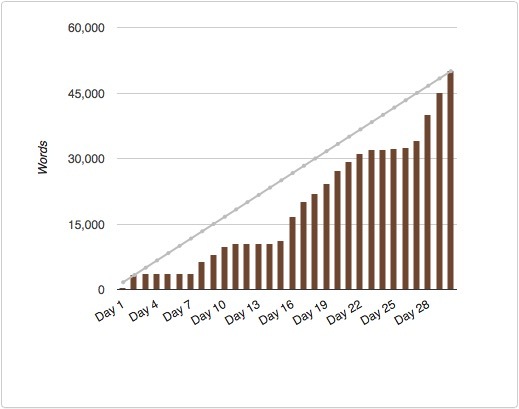 Through sheer, frenzied determination on those last three days I hit my 50,000 word goal but that only took me to about half way through the story. I thought that I would keep going over December and January, probably get to about 100,000 words and then spend a few months cutting 20,000 of those in the next draft. Except I started to realise that something wasn't right with the story. Well, there were a lot of things that weren't right, but I was in the shower one day, thinking about the ending and how I would get there, when it hit me. A pretty major plot point needed to be changed. I knew, from the second I thought of it that it would require starting again. I knew if I changed this one thing then it would change everything else. Events, characters, relationships, and not just in this novel but in the sequels I've half thought of too! So much of this story would have to be started over again. God, it was going to be a lot of work. Too much work! But I also knew that it was the right call and that it would make the story so much better. It would also make finishing this draft absolutely pointless. I emailed a friend about it. I told her what I already had and what I would need to change. I told her how changing this one thing would have a ripple effect on everything else. I asked her what she thought I should do. She agreed with me. Change it. It'll be stronger. At least I realised it needed to be changed now and not half way through Book 2. So I never finished this draft. There are certain things in it that I'll use in the next draft but this one is getting demoted. No longer Draft 2.0, now Draft 1.5. Nothing is wasted, everything is material, blah blah blah. It stings a little to know that I have to start over again. Again. But sometimes you have to know when to cut your losses. This draft? A necessary loss. Of course, now it's August 2017 and I still haven't started the New and Improved Second Draft, but I'll tell you more about that next time.